Hey, a little ash ain't gonna kill ya! Cooking over a campfire is one of those things in life that you just can't explain to someone that's never done it. Everyone knows of the toasted, melted, burned, dropped in ash and wiped off marshamallow treat loved by kids of all ages. But, even better is the smell of bacon or cobbler or beans mixed with the smoke from burning oak or pine. You can't bottle that smell! And, the taste! Dude, hang on while I wipe the drool off my chin. You've got to try real campfire food to appreciate it. Stuff that you'd dump in the trash at home is a delicacy in the wild. OK, so I've convinced you that you've got to go start a fire and cook something. How do you do it? 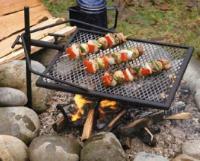 Well, here's the more common ways to cook on a campfire. Each method has its place and anyone you ask will tell you their favorite. Try them all and broaden your culinary delights. This is the most common way of cooking at campfires for kids. Stick a hotdog on a stick, give it to the kid, and let him cook. It's a great way to warm up simple food like that, but it is also a useful way to cook individual servings. Just like barbequeing on the gas grill at home. Wrap up your food, toss it in the coals, and wait awhile. Everyone gets to put their own meal together just the way they want. Forget the foil, just put the food right in the coals. 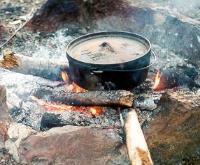 Coat an egg or potato with a layer of thick mud paste and cook it. With a dutch oven, you are set! Anything you want, you can have.